The gold market held its ground yesterday, closing at $1,728.9, as investors waited to see whether the truce in the Middle East would hold. However, this is not the only uncertainty that has constrained the precious metal within a narrow trading channel this week. Gold continues to trade around the $1,730 mark as investors' risk appetite fluctuates as they watch US lawmakers try to avert the looming fiscal cliff. Many bullish investors also believe that the central banks will continue their loose monetary policy in the months to come, which would support the price of gold. In addition, the European situation is still uncertain, but there are expectations that Greece will receive its next bailout tranche after a meeting of finance ministers on Monday. Finally, volumes are being affected by the Thanksgiving holiday in the US, adding to the cautious attitude. Nymex crude oil posted a slight decline yesterday, retracing just $0.49 to $87.15, amid ongoing fears that a cease fire in the Gaza Strip is too fragile to hold. Better-than-expected Chinese manufacturing figures also put a floor under crude oil prices as they indicated that the world's second biggest economy might be on a recovery path after 7 quarters of slowdown. Reports that central banks around the world are still on a gold buying spree kept commodity investors fairly optimistic regarding the fate of the precious metal. The ongoing conflict between Israel and Hamas also convinced participants not to sell their current long positions, despite signs that a cease fire might actually hold. As a result, gold moved up to $1,728.1 and is already on the advance this morning. The continuing tensions in Israel signalled growing instability in the Middle East region and kept crude oil prices well supported yesterday. At the same time, the US weekly inventories dropped by 1.5 million barrels against estimates for a 0.8 million barrels rise. Consequently, the WTI crude oil market rose by $0.39 to $87.64. Gold posted a slight decline yesterday, losing $3.1 to $1727.1 as the demand for safe haven assets was negatively affected by expectation of a ceasefire in the Middle East. The precious metal is hovering around the 9-day moving average. The short-term trend indicates a consolidation pattern. Speculation that Hamas and Israel were getting closer to a truce triggered a tumble in crude oil prices yesterday. West Texas intermediate lost $1.74 to $87.29 as the so called Middle Eastern premium started to unwind. Later on today, the US Department of Energy releases its weekly inventories which will undoubtedly will capture energy sector's attention. Gold is trading steady this morning after closing at $1,730.4 yesterday and seeing its biggest intraday high in two weeks. The precious metal is being underpinned by expectations of further central bank action and a stronger dollar after France's rating downgrade. Support for the market is also coming from hopes of a solution to America's fiscal problems and building tensions in the Middle East. Over the past two days, sentiment across the markets has improved as US lawmakers expressed confidence that a deal over the fiscal cliff will be reached in time. This would avert the automatic tax hikes and spending cuts that could force the US into recession in early 2013. Nevertheless, until we actually see the results of these talks, many think that gold will remain within a tight range of around $1,700-1,740. The energy sector has remained well supported by the danger of disruptions to crude oil supplies amid ongoing tensions between Israel and Hamas in the Gaza Strip. As a result, the price of WTI crude oil rose for the second day in a row, gaining $1.79 to $89.09 per barrel. Confidence that a deal will be reached in the US to avoid tax increases and spending cuts also encouraged energy CFD trading investors to go long of crude oil. The gold market dropped around 1% last week as the dollar strengthened for the fourth week in a row. The precious metal slipped $3.6 and closed below its nine day moving average at $1,710.9. Nevertheless, this morning, the precious metal is gaining for the first time in three days as the continuing talks over the US fiscal cliff have lent support. The market is also seeing some safe haven appeal in the face of rising tensions in the Middle East. In the short-term, the direction of the dollar is likely to depend on developments in the US and Europe, and this could well underpin gold's direction. The conflict in Israel seems to be escalating and could potentially engulf other Middle Eastern countries, threatening crude oil supplies. As a result, the price of WTI crude oil rallied on Friday, gaining $1.26 to $87.00, reflecting the security premium. Crude oil prices were also supported in overnight trading after Israel called up 30,000 reserves. The gold spread trading market slipped by around $10 yesterday, closing at $1,715.2. This came on news that global gold demand had dropped by 11% in the three months to September, tumbling from record levels seen in the same period last year. The World Gold Council's report showed that this was mainly due to a decrease in Chinese demand, with larger physical demand from India partly making up for this fall. 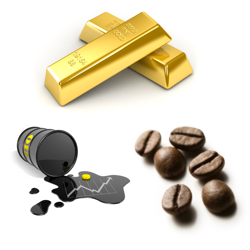 Nevertheless, many commodity investors seem to think that the precious metal could still shine if talks fail in the US regarding the fiscal cliff. Of course, if the politicians can actually achieve outright success in avoiding the fiscal disaster, this could dampen any positive sentiment. However, the most likely outcome is that a compromise will be reached and this may still benefit gold as it could easily involve more stimulus measures. The price of WTI crude oil closed $1.07 lower yesterday, settling at $85.67 per barrel. This came as support from unrest in the Middle East was overshadowed by weak unemployment numbers in the US that reignited pessimism about future oil demand. We saw a rather quiet day for gold yesterday, with the precious metal ending $1.9 higher at $1,726.3, despite a tumble in equities and a rise in crude oil prices. It seems that spread trading investors are still in standby mode after last week's comeback, awaiting further news on the US fiscal cliff or the Eurozone crisis before jumping back in. The energy markets were immediately affected by news that Israel had carried out a series of airstrikes in the Gaza Strip, killing a Hamas leader. Fearful that further unrest in the Middle East could threaten supplies, investors pushed the price of Nymex crude oil $1.07 higher to $86.40. This gain came despite a plunge in stock market indices, which is usually a bearish influence, so the conflict premium clearly overshadowed the economic issues. Gold has edged up by around $3 this morning, snapping a three-day decline after it closed at $1,724 yesterday. Fiscal cliff concerns in the US have added to gold's safe haven appeal. However, worries about the debt crisis in Greece are keeping prices in check as investors remain cautious. The precious metal peaked in 2011 when Europe's debt crisis seemed to be gaining momentum but, for the moment, market sentiment will be swayed by the outcome of Obama's address on the fiscal cliff and how the US proceeds. Estimates for a rise in oil inventories pushed WTI crude oil $0.21 lower yesterday, with the market closing at $85.34 per barrel. This comes against a background dominated by a gloomy economic outlook in both Europe and the US, and after Japan has already announced that it slipped back into recession. This week's US stockpiles report will be released on Thursday because of the Veterans Day holiday. Gold is slightly on the back foot and closed around $3 down at $1,727.6 yesterday during thin holiday conditions. Commodity investors have seen that the recent dollar strength is due to euro weakness after it dropped to a two-month low against the US currency. Uncertainty about Greece's debt burden is keeping investors cautious, and weakening share prices caused them to sell bullion to cover their losses elsewhere. The price of US crude oil resumed its decline yesterday, losing $0.52 to $86.05 a barrel, amid heated debates in the US about averting the fiscal cliff. Furthermore, oil supplies in US remain elevated. A Japanese report indicating a deteriorating economic outlook put further downside pressure on crude prices and, with China also showing it is well supplied, it was hardly a surprise that the bears won the day. Gold closed at $1,730.4 on Friday and has edged up by around 0.2% this morning. This is the precious metal's biggest weekly gain since late August as investors sought a safe haven in the light of worries over the US fiscal cliff. This issue seems to be driving sentiment at the moment and Obama will speak on Wednesday about the situation where there are signs of compromise between Democrats and Republicans. Should this turn out to be the case, the news may negatively affect gold, however, the prospect of negative real interest rates and longer-term inflationary risks could provide some support. Unlike the dormant equities, crude oil managed to climb on Friday, gaining $1.15 to finish the session at $86.10 a barrel. The rally was supported by a rebound in US consumer confidence which somewhat discarded the pessimism regarding the stalemate on the US political arena. The data suggests that, despite what happens in Washington, the demand for energies might stay strong enough to keep crude oil prices well supported.